If there’s one event at the top of my calender this year its the ECBACC! The origins of this page lies in my original thesis that Black children, Black boys specifically would be more inclined to read and enjoy it by way of using comics books. Not just any comic books but those which featured characters which looked like them. I live in a predominantly black country where male literacy is shot to hell along with any semblance of black nationalism. Skin bleaching is in, literacy and racial pride are out! That’s why when I wanted to start off 2011 with the ECBACC who are big on promoting literacy among youth. If I had the money I would be here in a heartbeat! Alas big dream and no money = what I can afford to do! Set for May 2011 all WOBH members who can should make an effort to support this wonderful cause! 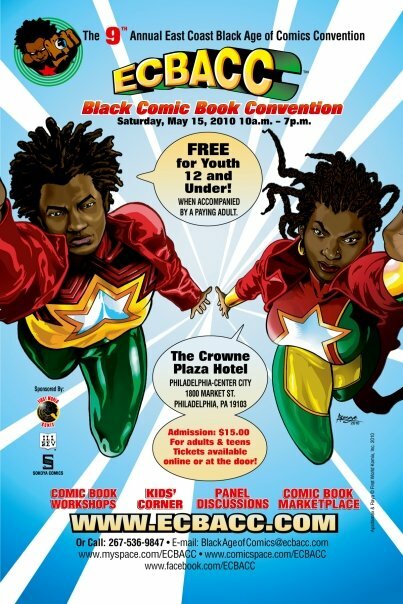 What is The East Coast Black Age of Comics Convention? The East Coast Black Age of Comics Convention, originally slated to be called the Pan-African Comic Convention (PAC-Con) or First World Komix Con (1st World Con), is an annual gathering of comic book artists, writers, their fans and retailers who are interested in discussing, buying and selling comic books, sci-fi, action figures and related material by and / or about Black superheroes / super-powered characters / adventures. In addition, the Convention also features panel discussions, self-publishing and graphic arts workshops for aspiring creators, and film screenings of works of veterans and amateurs alike. The Convention is held in Philadelphia each May preceded by a reception / awards ceremony. 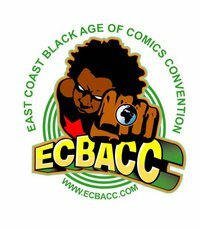 The ECBACC is the first bona fide “Black Comic Book Convention” in Philadelphia, PA, and serves as a replicable model for community-based comic book conventions. The ECBACC has successfully cultivated images of Black super-powered characters and has effectively served as a nexus, conduit and catalyst for Black comic book creators, their colleagues and fans since 2002!